Palmizana, a 300-hectare fragment of Croatian paradise, was bought in 1906 by Professor Eugenio Meneghello. Over 100 years later, it’s still being looked after by the Meneghello family, who have transformed it into a bohemian and delightfully rustic retreat of stone bungalows and villas, set within glorious botanical gardens on the tiny car-free island of Sveti Klement. The buildings have been thoughtfully designed to blend harmoniously with the stunning island environment: it’s car-free and there’s limited WiFi so the owners have kept in-room technology to a minimum (no TVs here) in order to create an atmosphere that will naturally draw out the hippy at heart. It’s also perfect for families who will love the sheltered bays and abundance of activities nearby. Rooms: When it comes to sleeping, there are a number of options at Palmizana. The bungalows (sleeping 2-4) are simple but charming spaces made up of 2 rooms – one bedroom and a living room that can be adapted to accommodate another bed. The cosy interiors are furnished in a Mediterranean style and Croatian art adds pops of colour to the exposed stonework and cool tile floors. 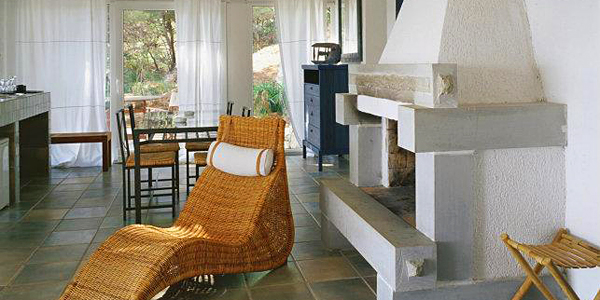 Each bungalow is named after the shade that dominates the interior. Our favourite, Green Bungalow, has a lovely mezzanine level sleeping area. There’s a great range of larger villas, too. 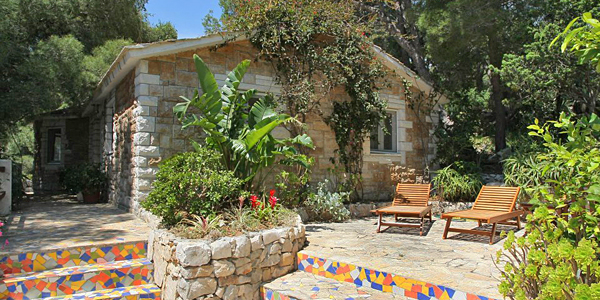 They can accommodate 4-6 guests and all have basic facilities for preparing coffee and snacks. With a private path leading down to the shore and an enormous terrace overlooking the bay, the White Villa quickly established itself as one of our favourites. But that isn’t necessarily the trump card, as you can always consider the luxurious octagonal living room, 2 bathrooms and colourfully mosaicked outdoor terrace of Villa Palmizana, or the slightly more modern Turquoise Villa, with its blue furniture and sea-view stone terrace. If you’re coming as a large family (or 2) you should plump for Villa Giorgia which has ample space with 3 ensuite double bedrooms and an additional 2-bedroom suite. Food: Owner Dagmar Meneghello personally oversees the resort’s 2 charming restaurants. 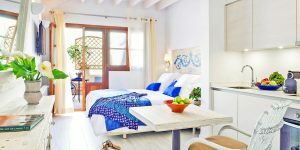 The first, Palmizana, is also where you can choose to enjoy breakfasts (standard rates are accommodation only) of fresh fruit, croissants, eggs and pancakes on the romantic terrace. 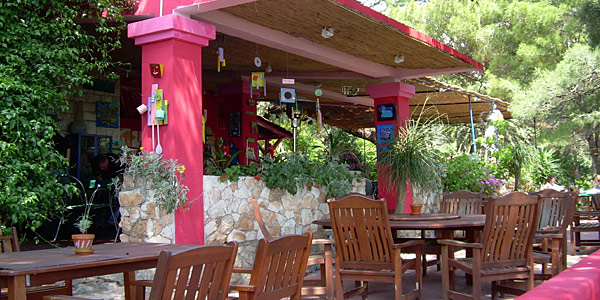 The second eatery, Toto’s, lies directly on the beach on the south of the island. 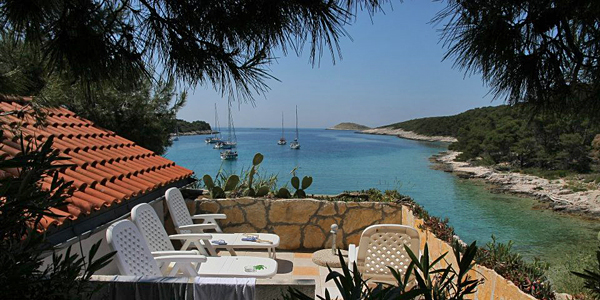 Both are beautifully located with terraces overlooking the sea and serve a variety of simple seafood, grilled meat and fresh vegetables in typical Croatian style. You can also look forward to the enormous outdoor grill being fired up for delicious fare cooked by Dagmar herself. In the evening, both restaurants are bustling with guests who have jumped off their yacht for a spot of dinner. At this point, warm and welcoming Palmizana comes into its own with its deep fuscia walls and playful modern art. We enjoyed a healthy dinner of excellently cooked local sea bass filleted at the table by our friendly waitress. These 2 restaurants aren’t the extent of the gastronomic offerings on the island though, and many guests explore the other restaurants and beach bars lining the coast, or make use of the water taxis to visit buzzing Hvar Town. 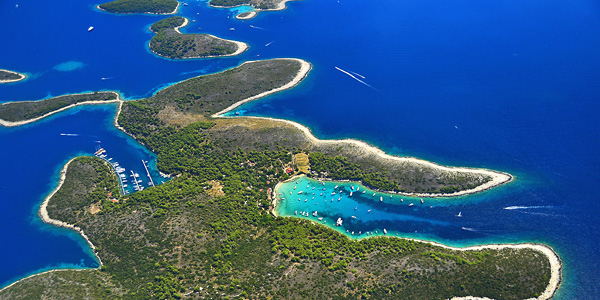 When to go: Because Sveti Klement Island is so popular in July and August, when hordes of Italian tourists flock to the Croatian coast, the best time to visit is May-June or September-October. You’ll have more of the island to yourself and the temperatures are milder, but the sea is still warm enough to swim in. i-escape gift: a free room upgrade (when available) and i-escape honeymooners receive a free bottle of Prosecco.